No Return first emerged as a hard back picture book in 2011. Now Lothian have published it as a paperback, however there is no separate map which accompanied the hard back version. My review of the original publication was posted on Buzz Words Books on 15th November 2011. 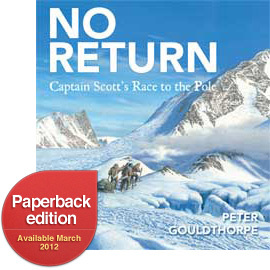 Tasmanian-located Peter Gouldthorpe is a CBCA award winning author/illustrator and his talented artwork is showcased in this recounting of the race to the South Pole by Robert Falcon Scott. Lieutenant Scott heads The National Antarctic Expedition in 1901, sailing from London in the Discovery. He hopes to fulfil his dream of being first to reach the South Pole. A secondary purpose is to gain scientific knowledge of plant life, the climate and the geology of this frozen land. Among Scott's party are Ernest Shackleton and Edward Wilson and 19 huskies. The men trek to within 850 kilometres of the South Pole, but are forced back by terrible deprivation and the loss of all the dogs. Nevertheless, they remain there for two years before arriving back in England in 1904 with their data of new scientific discoveries. Scott is hailed as a national hero and promoted to Captain. Interest revives in the South Pole after Robert Peary conquers the North Pole in 1909 and Shackleton’s own expedition to Antarctica comes close to reaching the Pole. Scott, spurred on by this news, forms a second expedition funded by himself. On June 1, 1910, the Terra Nova sets sail for Australia. While docked in Melbourne, to Scott’s dismay, a telegram arrives to say Roald Amundsen, a Norwegian explorer, was challenging him in the race to the Pole. Scott sends out two exploration parties. One returns with the news that Amundsen's ship has anchored in the Bay of Whales. Scott works out that the Norwegian will be 97ks closer to the Pole than his own party. Wondering whether his rival will reach the Pole first must have lain heavily on his mind through the long winter months. The many experiences of the twenty-five men who remain behind after the ship returns to New Zealand are recorded in both text and brushwork. Peter Gouldthorpe's detailed and powerful illustrations magnify the horrendous conditions and challenges Scott's exploration party face. -44°C temperatures without modern thermal clothing would have been daunting enough, but along with the blizzards, the men suffer fatigue, hunger, frostbite, painful snow blindness, and loss of companions and horses (whose meat provided valuable food). The picture book's title is well chosen and the reader is in no doubt of the outcome. No Return: Captain Scott's Race to the Pole pays homage to Captain Scott and his team. Their courage, determination and sacrifice is an inspiration and has reserved them a well-deserved place in history. A map is printed on the last page of the book showing the adventurers' routes. There is also a time line which is an excellent tool for an instant overview of the race to the South Pole.